Scroll through the photo gallery below for all the 5K fun! Race Starts at 8:30 a.m. // Frosty Freez Kids' Run at 8:15 a.m.
Run, jog, or walk your way past beautiful views of Second and Third Beach and Norman Bird Sanctuary’s rolling fields and rocky ridges while the birds cheer you on! Kids can join the fun by registering for the Frosty Freez Kids’ Run. Join us back at the Sanctuary after the race for refreshments and the awards ceremony with live music by Newport Sound & Entertainment. 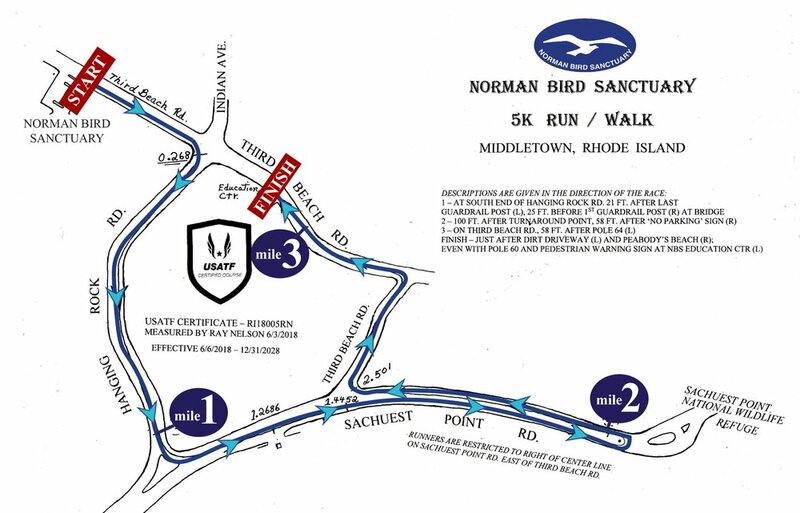 A major fundraiser for Norman Bird Sanctuary, this race also honors the memory of David Leys Jr., a native islander and great friend who helped create this special event. After a courageous five year battle against ALS, Dave passed away in August of 2017. Online registration closes at midnight on June 13th. Day-of registration begins at 7 a.m. on race day. Registered participants are encouraged to attend Friday bib pick-up on June 14th from 5 - 7 p.m.
at Norman Bird Sanctuary to alleviate race day delays. Race day bib pick-up begins at 7 a.m.
All runners will receive a race bib, timing chip, and swag. Top overall male and female finishers will receive a Cooling Towel & Pouch and a package from Bridge to Fitness valued at $600 each. Package includes a 1 month membership, personal training session, chiropractic assessment, consultation with dietitian, and tennis lesson. Top three male and female finishers from each age group will receive NBS 5K Cooling Towels & Pouches. Limited parking is available at Norman Bird Sanctuary and along Third Beach Road. We encourage participants to carpool and arrive early. The Norman Bird Sanctuary 5K is a rain or shine event. in the event of extreme and severe weather, the race may be delayed as race officials consult public safety officers. If there is more than a short delay, if conditions persist, or the forecast for extreme weather, race officials reserve the right to alter or cancel the race. Please check the website, our Facebook page, and your email before the race for any changes or cancellations. If you have any questions, please review our website or do not hesitate to contact us. We offer 100% cotton Adult 5K Logo shirts for sale through May 30th. A limited number of shirts will be available for sale on race day. Kids special Norman Bird Sanctuary cotton T's are available for purchase throughout registration and on day of race. Become a 5K Sponsor Today! Thank you to our Kids' Run Presenting Sponsor! Thank you to our "Screaming Eagle" Sponsors!